Rear Stage Curtains are normally black in colour, giving the rear of stage complete shield from the audience. 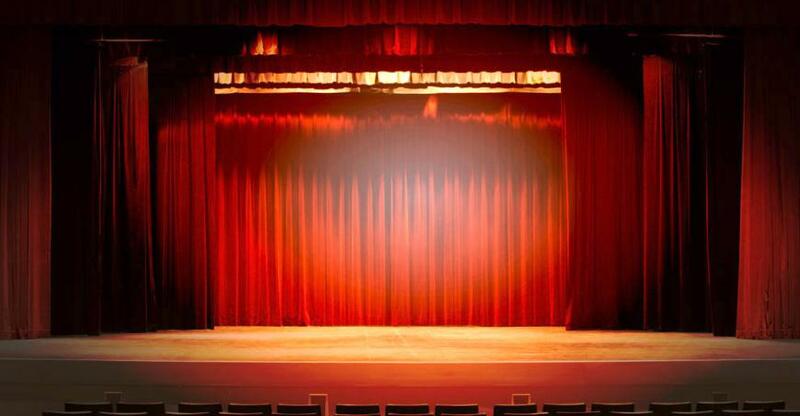 Rear Stage Curtains are normally hang in the rear of the stage, but they can also be used in middle and downstage to make the stage appear hollow. Rear Stage curtain is adjacent to the backdrop. They can remain closed throughout the play, or can be opened to reveal scenery or some special effect on the cyclorama. The rear stage curtains serve the purpose of masking back of the stage. They have a separate frills and frame, and back wings aid their effect. Their shade can colour can vary from the one in the middle and the grand valance. They are ideally vertically lifted, however, traveller, or bi-parting drapes are also commonly used. These not only serve the purpose of masking, but they also allow more absorption of reflected sound, making dialogues clearly audible to the audience. These allow the stage to look more spacious and focused. Their colour and fabric adds their own benefits to the performance. The cyc screen behind the backstage curtain remains hidden and protected, as well as, the fire proof shields. The frills on top mask the tracks, scrim holders, backdrop layers and rollers. The backstage curtain serves multiple purposes.